The Triad Community Unit School District provides student transportation service to approx. 2,700 school students attending the seven school attendance centers. 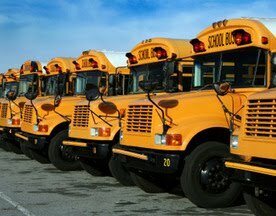 The Transportation Department is responsible for the daily operation for student transportation to and from school, scheduling of all field, athletic, and co-curriculum trips. Eligibility for transportation service is governed by the Board of Education Policy on Transportation Eligibility. Generally students are entitled to free transportation service if they reside 1.5 miles from the attendance area school or become eligible due to a state approved walking hazard zone. Transportation safety is a shared responsibility and is enhanced with the active participation of students, parents, school staff, and our school bus drivers. School bus safety training is conducted with students and staff each year. Students and parents in grades 6-12 can review the building transportation schedule through the PlusPortals system and grades Kdg-5th will receive information in the parent letter mailed a week prior to the beginning of school. If you have any questions or would like to review other bus stop locations, please feel free to contact the Triad Transportation Department or school office. The Transportation Department is open on school days during the regular school year from 06:30 AM until the last school bus clears its afternoon route sequence, generally 4:30 PM. If your student is bus eligible, you will receive a letter from our office approximately one week before the start of school stating the bus number, pick up time, and the A.M. pick up location. The P.M. drop off location will be the same as the A.M. pick up location unless the parent/guardian completes a bus change request form. Will your student attend daycare? If so, you are required to complete a bus change request form. The daycare forms are available from the building secretaries or by contacting the transportation office. Students in Kindergarten thru 5th grade are only allowed one drop off location in the afternoon (Monday thru Friday). Kindergarten thru 2nd grade students must have an adult present at the bus stop for drop off in the afternoon.